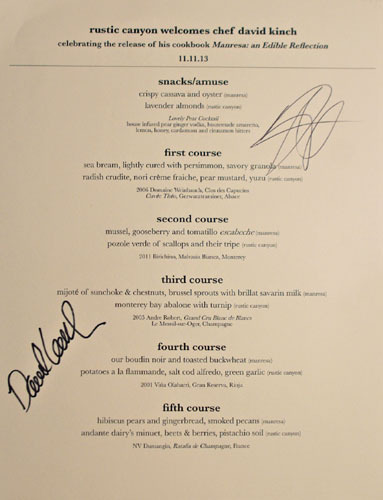 It's been a while since I attended a collaborative guest chef dinner, but this one caught my eye, reuniting Rustic Canyon's Jeremy Fox with his mentor David Kinch of the vaunted Manresa up in Los Gatos. If you recall, Fox began at Manresa back in '03, starting from the bottom and working his way up to the role of Chef de Cuisine before leaving in 2007 to start Ubuntu. This one-night-only affair also served to promote Chef Kinch's new cookbook, Manresa: An Edible Reflection, co-written with Bon Appétit's Christine Muhlke and with photography by Eric Wolfinger. The night's menu featured six courses from Kinch, each paired with a corresponding dish by Fox. Dinner was priced at $95 a head, with optional beverage pairings tacking on an additional $45. Click for a larger version. The first of our pairings eschewed wine in favor of the aptly-named Lovely Pear Cocktail, which was pretty fantastic, showing off a bouquet of sweet-spice and a tangy, gingery, yet boozy taste that recalled the autumnal season. 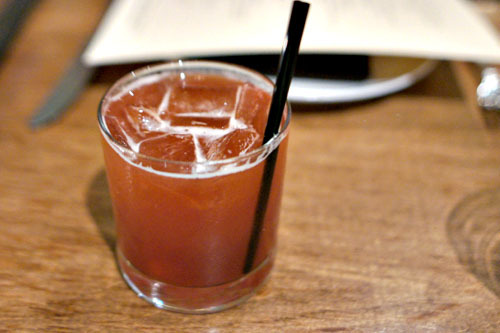 The Maple Berry Smash, meanwhile, was appealing in its own way, a balance of fruity, tart, and bitter flavors underscored by an intriguing interplay between the Bourbon and maple. Kinch's cassava was a fun way to start the meal, the roots coming out sweet and starchy, but with a savory element to them that was really amplified by what seemed like the distilled quintessence of oyster. I just wanted to keep eating. Going along with the cassava were Fox's signature nuts, an almost universally pleasing, crunchy amalgam of salty and floral nuances that read simultaneously simple yet profound. The Chef should be selling these by the bagful. Our first course proper was a winner. 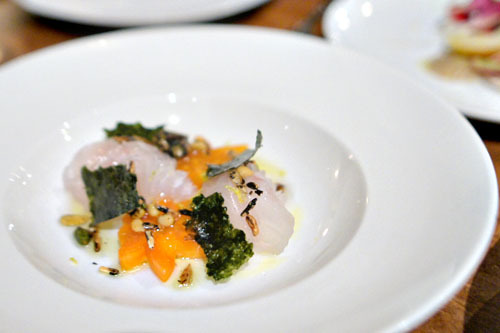 I found the bream clean and crisp, with a delicate taste that was superbly enhanced by the umami-rich, Asian-y relish of the accompanying nori, all while the persimmon imparted just the right amount of sweetness into the fold. The best part? Those bits of granola, which gave the course a fantastic crunchiness and a delightfully savory, lingering finish. The wine here was a smart pairing as well, the intensely aromatic, floral qualities of the crisp, stonefruit-laced Gewürz pairing swimmingly. Fox followed up with a stunner of his own. 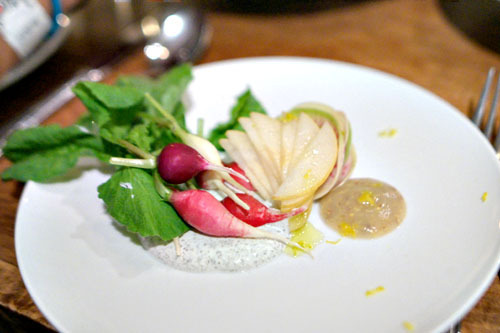 The Chef has a well-known penchant for radishes, and here they were put to excellent use, their crisp, bitter qualities melding flawlessly with the lush, creamy nori crème fraîche, all while the pear provided a modicum of sugar to bring it all home. The linkages between the two courses, anchored by the use of seaweed and a countering sweetness, really made the combo work for me. 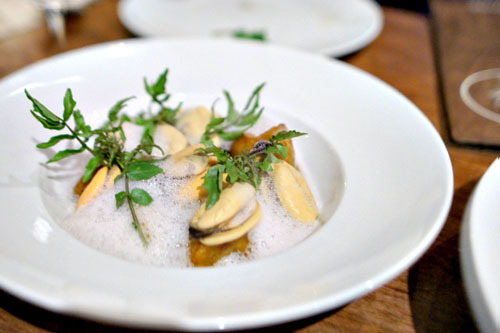 Mussels were spot-on in terms of texture and taste, their salty smack on display, balanced seamlessly by the hearty base of potato and the escabeche qualities in the course. 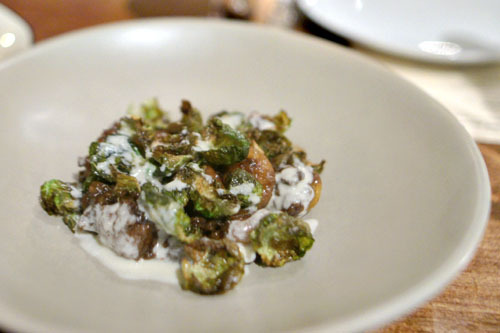 However, the use of gooseberry seemed to work against the dish, giving us a rather jarring tartness that distracted from all the other great things going on here. We had here a variation on Fox's epic pozole that I had on my last visit. 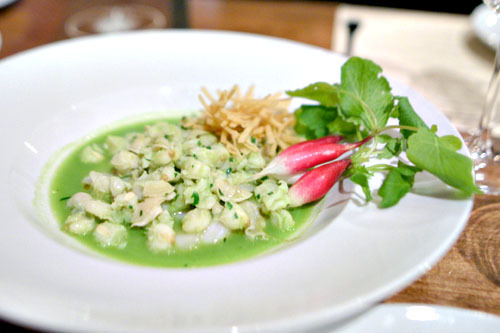 This version was just as good, with the supple slivers of scallop supplying a softly saline base to the dish, enhanced by the use of the more substantial "tripe." 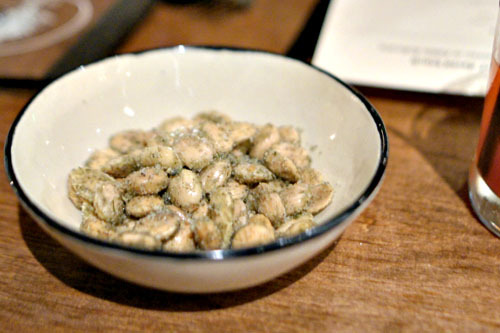 That, coupled with the bright, verdant flavors of green garlic, was a masterful blend of elements that really worked for me, especially when taken in concert with the crunchy bits on top and the hearty chunks of hominy. Time for more cocktails. 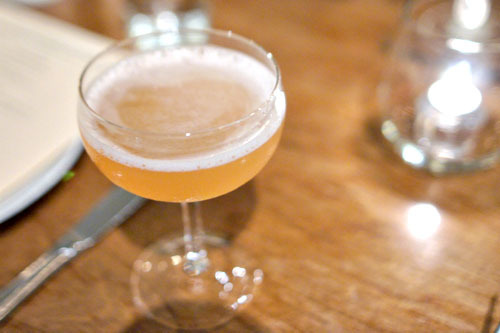 The Apple Jack Rose really lived up to its name, provided all the juicy, apple-y flavors that you'd want, augmented by the fruitiness of the grenadine, yet not overwhelming the goodness of the whiskey. 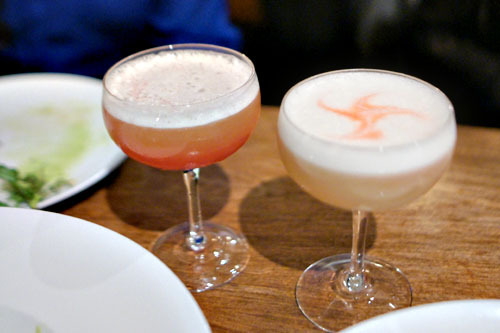 The Peruvian Sour, on the other hand, was a lighter sort of drink, a commixture of tart, sweet, and boozy that was easy to like. A stew of chestnut and sunchoke really tasted of the season, putting forth a sweet, nutty, comforting sensation, tied together by the cheese, that was utterly comforting. However, it was also on the hefty side, and I wanted more bitterness from the Brussels to balance things out. Abalone came out tender, but still with a nice chew to it, and was super buttery, saline, and delicious, with a delightful char astringency. It was certainly tasty alone, but the texture and astringency of the accompanying turnips really took the dish to another level. One of the highlights of the meal was definitely the boudin noir, which I can safely say was the best preparation of the dish I've had. I loved how the intense, earthy taste of the sausage was so gracefully presented--forceful, yet in a restrained, delicate manner. 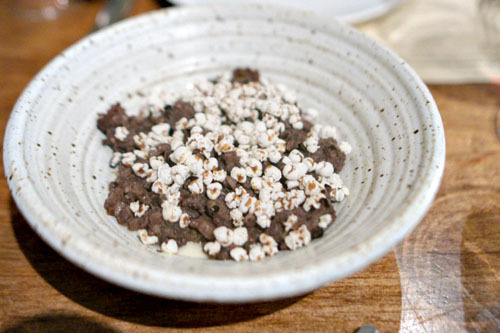 Add to that the sweetness of the traditional accoutrement of apple sauce, and the lightness and crunch of the buckwheat "popcorn," and you get a thoroughly modern, unique interpretation of the classic. It's almost like something I'd expect to see at Trois Mec. 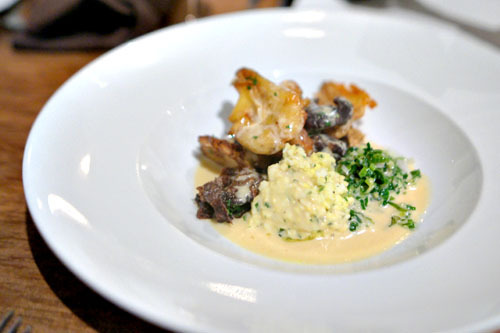 Finishing things off on the savory side was a rustic-tasting dish from Fox. 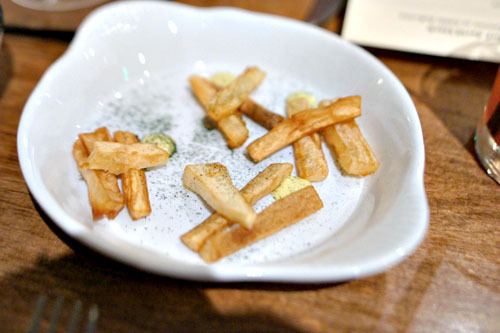 With the combination of morue and potato being used here, the dish was quite salty, and quite crispy too--satisfying in a base sort of way. 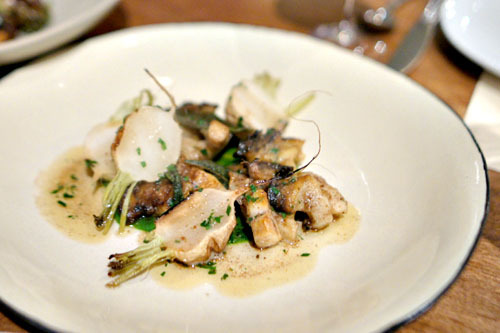 The crux, though, was that green garlic, which offered up a great bit of brightness and verve to the dish that really mellowed things out. 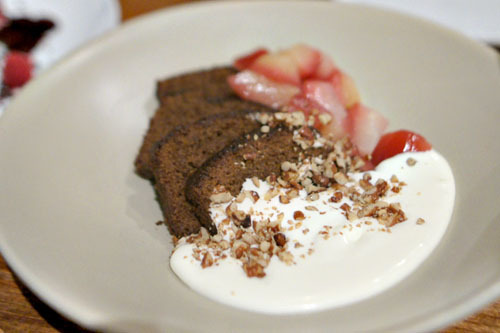 Moving on to desserts now, Stephanie Prida's gingerbread sort of paid homage to the season, arriving soft, moist, and teeming with sweet, spicy flavors that were just amplified by the perfume-y nature of those pears. 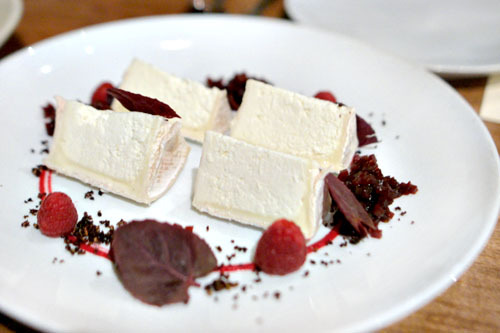 Rustic's Laurel Almerinda followed up with her version of a cheese course. Andante's triple-creme Minuet was proudly featured, its luxurious, lactic, and slightly funky nature keenly paired with the sugary smack of the beets 'n' berries. The flavors made sense, but the pieces of cheese were just too big, throwing the balance out of line to some extent. I'm always a tad wary going into these collaborative type dinners, but this one turned out well, though I wish that the courses would've been individually plated rather than served family style. That would've been a more elegant solution, and would have allowed for heightened precision, tighter integration. That being said, we did get a good taste of what these two chefs are capable of, and at the same time, we got to experience mentor and mentee, side by side, their complementary, yet unique styles all coming together cohesively in one meal. A fun, festive evening--a lovely time was had by all.